This is the Thai take on a dish that can probably be found at any Asian hole-in-the-wall eatery in the west. 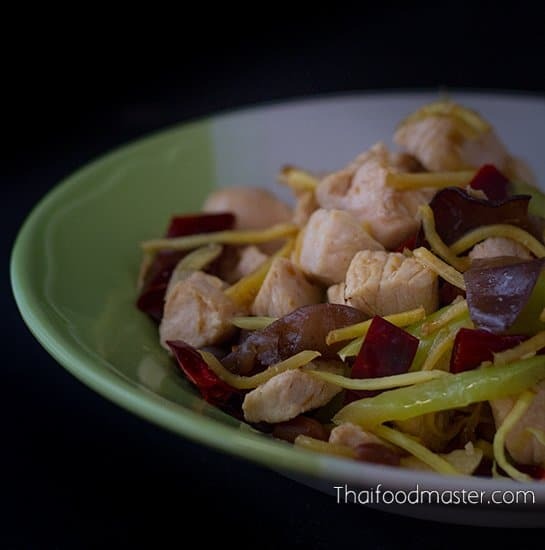 The soft, moist chicken meets the warm crunch of freshly toasted cashew nuts or, as they are called in Thai, the ‘mangoes of the high forests of India’. 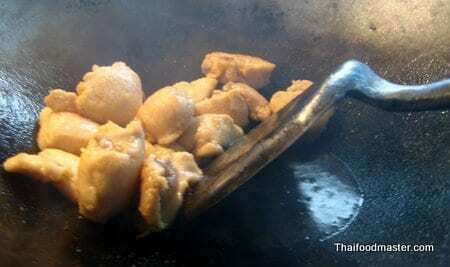 So, seek no more: here it is – the authentic recipe for Thai ‘Stir Fried Chicken with Cashew Nuts’. The dish captures the eye with its vivid color – It is beautiful! It is bright! It is happy! - and it fits well within the comfort zone of most westerners. 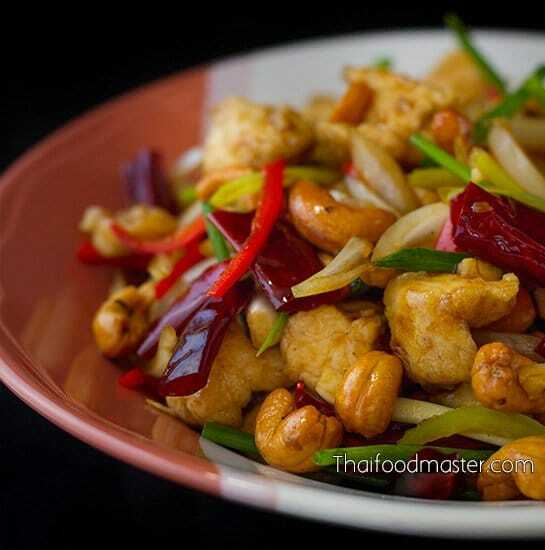 It is not surprising that this dish has made its way to the top of the charts, consistently ranked among the top ten tastiest Thai dishes served abroad. Mix all the seasoning ingredients. Set aside. 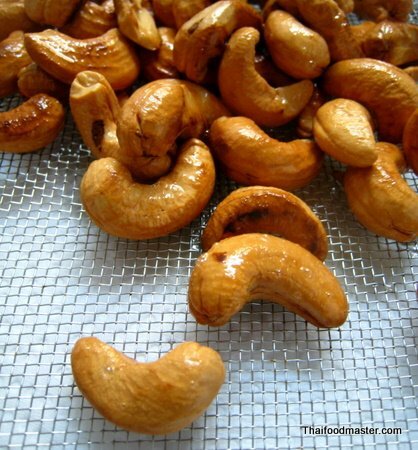 Fry the cashew nuts until light golden; set them aside on paper towels to absorb excess oil. 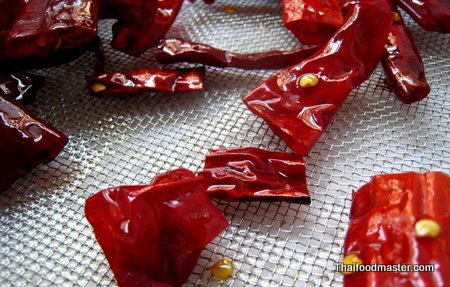 Fry the dried chilies until shiny and crispy; set aside on paper towels to absorb excess oil. 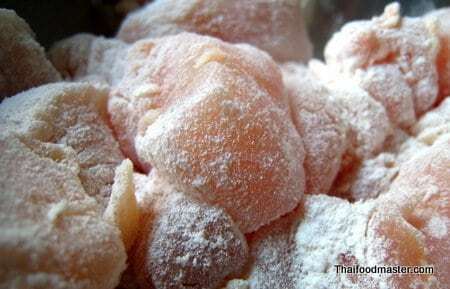 Roll the chicken cubes in flour. 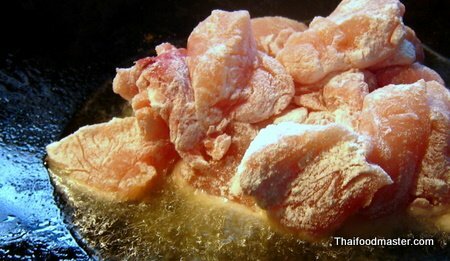 Remove any excess flour, and deep fry the chicken on medium-high heat until it turns light golden. Set the chicken aside on paper towels to absorb excess oil. 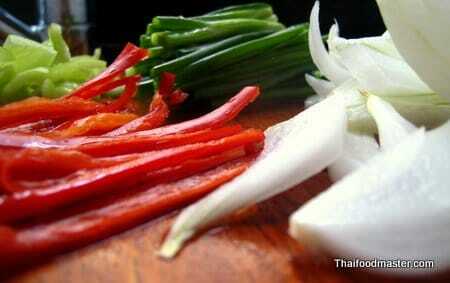 Julienne the long red peppers, and cut both the onion and the green banana pepper into thin slices. Set aside. 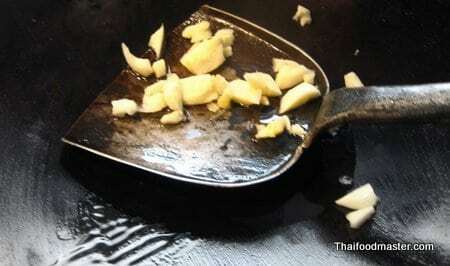 Wipe the wok clean with a paper towel, and place it back on the heat. 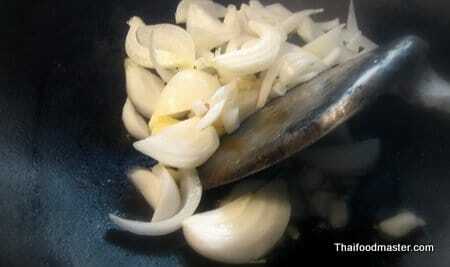 Add about 1/2 tablespoon of oil and the garlic, and stir fry quickly until fragrant; do not allow the garlic to brown. Add the sliced yellow onions, and stir fry until they become translucent. 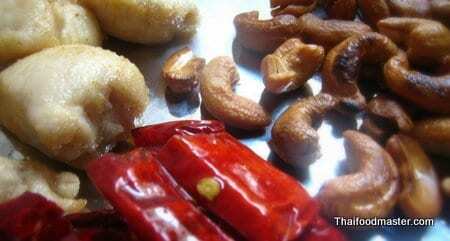 Add the fried chicken, along with the fried cashew nuts and fried dry chilies. Add the seasoning sauce and stir fry until it thickens : toss all the ingredients together until everything is evenly coated with the sauce. Add spring onions and fresh chilies and stir fry; mix. A quick and tasty dish from the hot mouth of the dragon with only three ingredients! Flowering Chives, Pork Liver and Garlic. Flowering Chives are all year round favorites for their mild garlicky flavor, and can be purchased inexpensively at almost any Asian market. 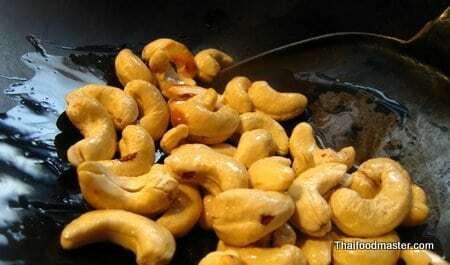 In Thailand we like to fry them with pork, pork liver or shrimp. These flowering chives are actually the unopened bud stems of garlic chives, also known as Chinese chives. Cured pork is made by fermenting a mixture pork meat, cooked pork skin julienne, salt, garlic and cooked sticky rice wrapped in banana leaves. During the summer we leave the wraps unrefrigerated until a rich savory and slightly sour flavor develops. This method of preserving meat goes back to the days before refrigeration was widely used. In this Northern style recipe I use homemade cured pork, though any commercial product from your local Asian store will do just fine. Blessed are the Thais for their unique attention for details. They do no spare efforts in creating intricate work of arts and their cuisine harmonizes flavors of robust ingredients in ingenious recipes. 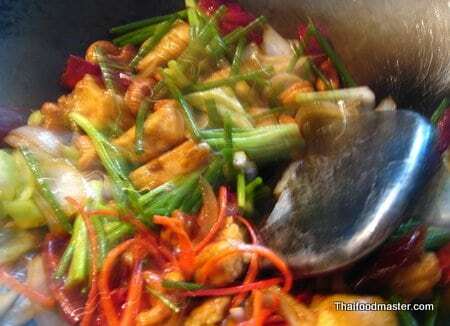 However, there will be days that even the Thais would crave for an easy, simple, cheap and tasty meal – a laid back, quick and down-to-earth menu – The Omelette, Usually served over rice, with Chili & Lime Fish Sauce (phrik naam bplaa) or as a side dish for a multi course meal. 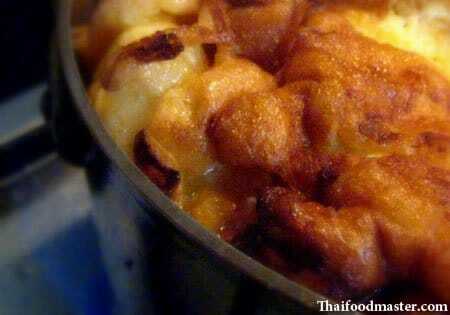 Great Thai omelette must have crisp borders and soft center. 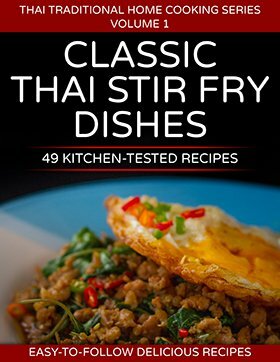 Endless tips and tricks were born in the search for a foolproof method of making the perfect Thai Omelette. Some will secretly add lime juice or baking powder, a drop of water or even frying the egg whites separately. Thank you for sharing your recipe. I saw the photo on Tastespotting and decided to make it for dinner tonight. Delicious. I’m looking forward to trying more of your recipes. I highlighted your recipe and blog on this week’s Saturday Blog Showcase. I made this dish for dinner Friday night. Very good. Thank you. 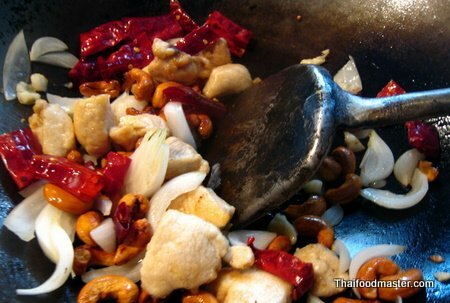 After watching ” I love Thailand ” during Songkran Festival, I was inspired by your passion and Stir Fried Chicken with Cashew Nuts is gonna be my first dish. 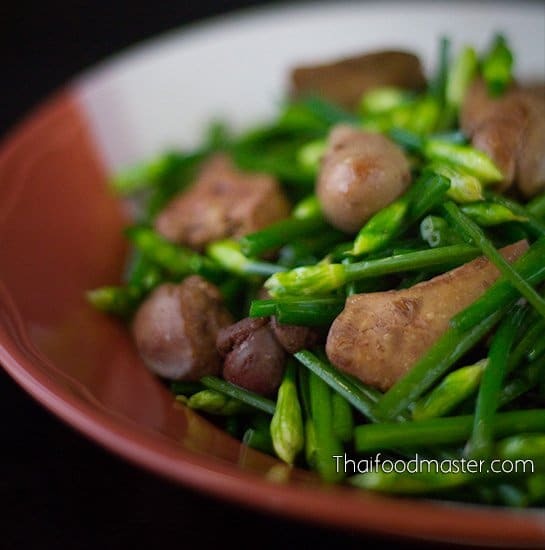 Definitely, I am becoming your fan of Thaifoodmaster.com. 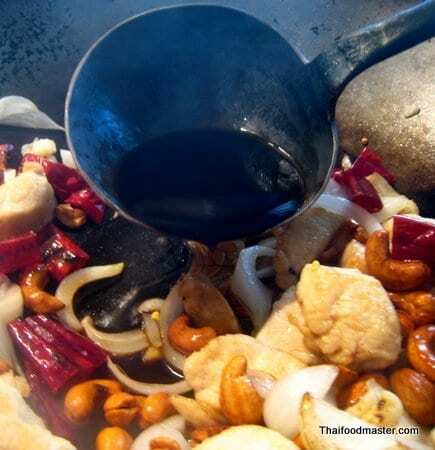 I so proud of you, all recipes very good picture , about the cooking step i try to understand (have some dont understand) such as i just to know Black Fungus ,itn’t Mashroom…oh Mr. Hanuman I love it…love all of your recipes, love for you love thailand, love what you do. well i will try to improve my cooking skill of course try to learning english skill language here, then I’ll cook thai receipes to my family and my BF (Australian) and i hope he will love thai food like you. thank you for a very clearly recipe ka. Good recipe,just made it a few minutes ago but forgot the garlic so the taste could have been a bit more yummy,never mind. 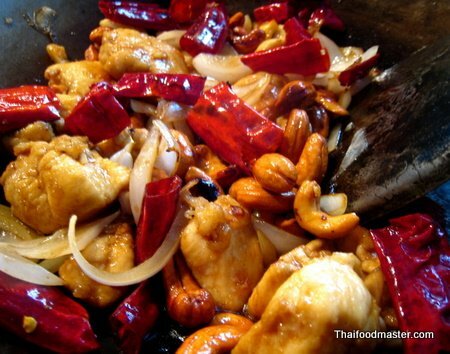 Hi Hanuman, I have tried many a times your cashew chicken recipe… They are simply delicious, simple, elegant, spicy & tasty..I love them. If you have eggplant chicken recipe with blackbean sauce please post it. 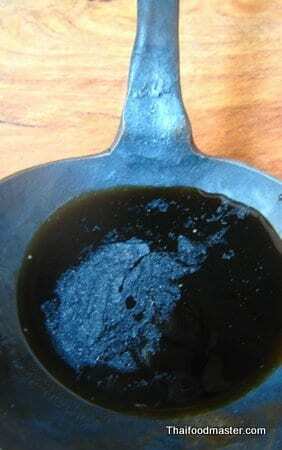 Pour the oil, garlic, ginger and onions over washed black beans. Steam for about 1-3 hours. when done, let cool and chop everything together. you are ready to stir fry your eggplants and chicken ! Made this meal for friends after my return from Bangkok, and its lovely restaurants and night markets, it turned out great and enjoyed by all. I make a similar version to this but I’ll have to try this recipe. Quick question, is there any reason why you fry dried chilies instead of fresh?